BANGKOK A positive jobs report that pushed the Dow to another record high this week and better-than-expected Chinese exports helped boost world stock markets Friday. China's exports jumped 21.8 percent to $139.4 billion in February, beating economists' forecasts by a wide margin. While lower than 25 percent growth in January, the figure provided evidence of strong demand for Chinese-made goods in the global marketplace. "China is still exporting its goods to the rest of the world. There is still global demand out there, so that's encouraging," said Andrew Sullivan of Kim Eng Securities in Hong Kong. February had been expected to be weak because the Lunar New Year holiday fell during the month, leaving fewer work days as businesses shut for up to two weeks. Britain's FTSE 100 rose 0.6 percent to 6,478.23. Germany's DAX added 0.8 percent to 7,999.57. France's CAC-40 gained 0.8 percent to 3,824.51. Dow Jones industrial futures rose 0.3 percent to 14,291. S&P 500 futures advanced 0.2 percent to 1,541.10. Japan's benchmark index posted its highest close since September 2008. 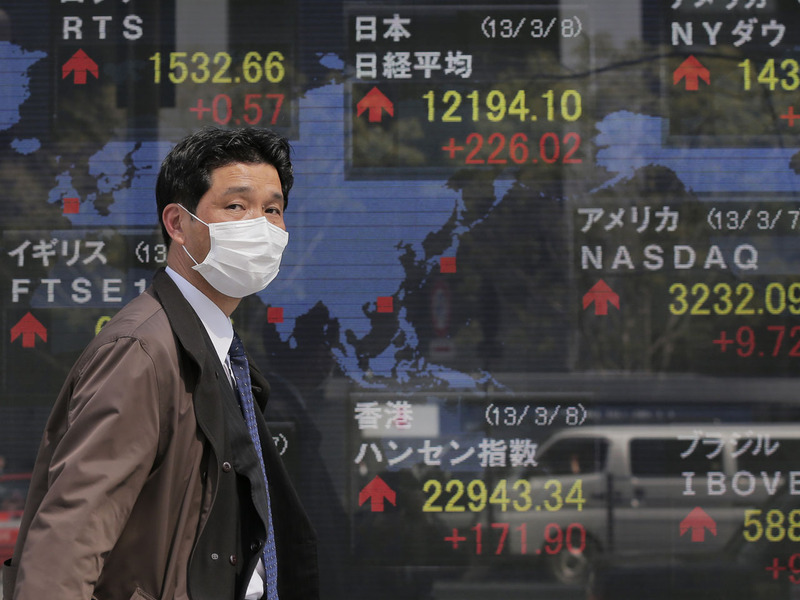 The Nikkei 225 index in Tokyo jumped 2.6 percent to 12,283.62, as a weakening yen boosted export-linked shares. Prime Minister Shinzo Abe's advocacy of a weaker yen to help support Japanese export manufacturers has lifted share prices and spurred a decline in the value of the Japanese currency. Hong Kong's Hang Seng rose 1.4 percent to 23,091.95. Australia's S&P/ASX 200 rose 0.3 percent to 5,123.40. Benchmarks in Taiwan, Indonesia, the Philippines and Thailand rose. Those in mainland China and Singapore fell. Among individual stocks, Japan's Mazda Motor Corp. jumped 5.8 percent. Video game maker Nintendo surged 8 percent. Virgin Australia fell 1.2 percent after a decision on the airline's proposed takeover of Tiger Airways Australia was delayed. Sentiment on Wall Street was boosted Thursday after the Labor Department reported that the number of Americans seeking unemployment aid fell to a seasonally adjusted 340,000 last week. Applications fell 7,000 in the week ended March 2, dropping the four-week average to its lowest level in five years. A drop in weekly applications suggests that companies are laying off fewer workers and that more hiring may follow. A government report Friday is expected to show that employers in the U.S. added 152,000 jobs last month. "Fewer firings and more hirings are bringing people back into the search for a job when they had previously been too discouraged to bother," said analysts at DBS Bank Ltd. in Singapore in an email commentary. "This is great news so the fact that the unemployment rate isn't falling as much as one would like, and probably not at all this month, doesn't mean things aren't happening under the hood." Benchmark oil for April delivery was up 8 cents to $91.64 per barrel in electronic trading on the New York Mercantile Exchange. The contract rose $1.13 to finish at $91.56 per barrel on the Nymex on Thursday. In currencies, the euro fell to $1.3087 from $1.3104 late Thursday in New York. The dollar rose to 95.48 yen from 94.85 yen.